Can I believe that a society confronted by climate change, dependency on foreign oil, pollution, and the cost to maintain a traditional vehicle is looking for more reliable options? Yes, I can believe it. Is the rate of EV adoption tied in with what car manufacturers make possible? Yes, I can believe that, too. This may have been my first trip to an EV Roadmap conference, but I can read the signs and see which trends are developing. And it’s not at all difficult to see and believe that people want to drive electric. Sitting in on the breakout sessions the conference provided a great glimpse into what car manufacturers, cities, states, utilities, and nonprofits are doing to create room on the road for EVs. States have helped drive adoption by creating incentives that reward people for driving more sustainable transportation. Utilities are working with customers to create non-peak charging hours with cheaper rates. Car manufacturers are putting forward vehicles that take range-anxiety out of the equation. And nonprofits are working with partners wherever they can to connect these vehicles with communities. Before I began working at REACH, I wasn’t very familiar with EVs. As a sci-fi fan I’ve long been an admirer of the future of transportation, but I wasn’t seeing it played out in real-life except for the frequent Tesla sightings in San Francisco. 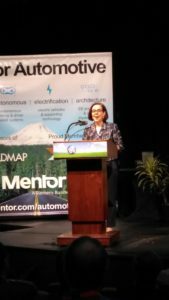 Now, it’s exciting for me to participate in EV Ride and Drive events across the country, and to speak with experts in the field at conferences like EV Roadmap 10. 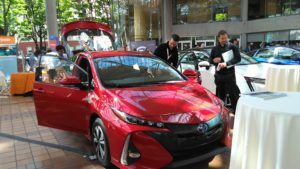 Data shows that cities and states with goals to reduce carbon emissions must make a switch to EVs. Otherwise, those cities and states will be unable to reach their goals because of the pollutants gas-guzzling cars put into the air. Utility companies can’t sit on the sideline for the EV conversation as drivers will depend on the grid at home, work, and on the road. EV charging is just one more way utilities can secure customers and create dependable, clean sources of energy. Car manufacturers are working to change their own perceptions of EVs. There have been reports in the past couple of years about car dealers not backing EVs or presenting them as viable options. Now manufacturers and dealerships are putting the spotlight on EVs as the range is increasing, new styles become available, and incentives help customers buy or lease. People are tackling the issue from all angles. For widespread EV adoption to occur it’s going to take more than a car manufacturer releasing new EV models or a state offering a tax credit. This has to be a united fight that brings all parties to the table. That means creating avenues to EVs for more than the early-adopters. Middle class and low income communities need and want clean air, too. Autonomous vehicles offer a different, safer way to provide public transportation. Improvements for sensors and battery technologies can make autonomous vehicles a more cost effective solution for cities and states. There is no one-size fits all solution. What works for California isn’t going to be the same plan for Mississippi. And states like Montana and North Dakota can learn from the model programs happening in Massachusetts, but they’ll need their own plan, too that addresses their unique challenges. For EV adoption to work, it has to work for the community. It’s just one more reason why car manufacturers need to offer multiple options. If the conversations and presentations at EV Roadmap 10 are any indication of what’s to come, we’re all in for an exciting time. We can’t let that excitement cloud our vision, though. It’s great to see the goal line, but we still have to run the length of the field. So can I believe that EV Roadmap 10 conference was the biggest one yet? Is it sensible to think improvements of EV technology will make cleaner cars the new norm? Can I fathom a world of autonomous transportation? Yes, I can believe all of that. EVs and autonomous transportation are presenting us with an opportunity to create a real change; not only for ourselves, but future generations. And at REACH, it feels great to be part of a team working to make that change a reality.